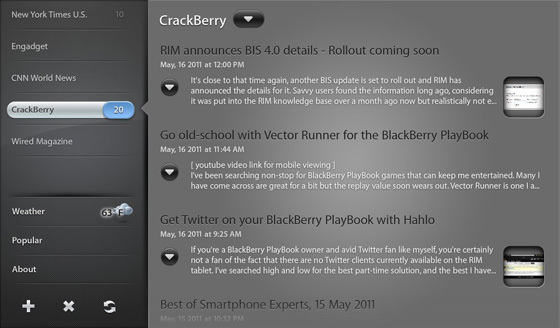 Pipeline is the BlackBerry PlayBook RSS news reader I've been looking for... almost. One of my favorite and most-used apps on my BlackBerry Torch is BlackBerry News Feeds. I enjoy the internet-at-a-glance that RSS feeds provide, with quick links to further reading on the web. With the latest improvements to that app, it has become my go-to source for quick reading about the world around me. Until recently, I sorely missed that feature on the BlackBerry PlayBook. Until recently. Pipeline and its paid counterpart Pipeline Pro is, of course, an RSS news reader for the PlayBook. And it gives weather information. Oh, and you can follow twitter feeds with it, too. The paid version -Pipeline Pro - features offline reading (when not connected to the internet) and Google Reader integration. With its grey, black, and white color scheme, Pipeline brings the news in a simple, elegant way. Adding a feed is so simple, it's brilliant. 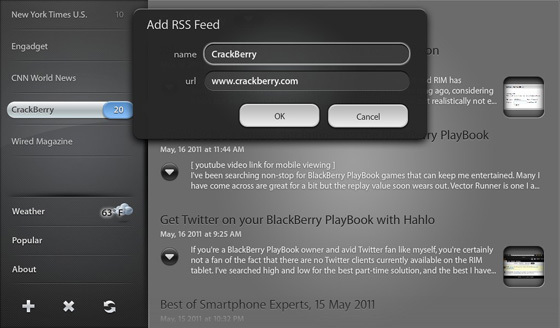 All you'll need is the website address (like www.crackberry.com) and Pipeline will extract the feed for you. No copy and paste or remembering where the question mark goes. After you've added your feed, you'll find the 20 most recent headlines on the right, with a preview image and text. Touching the headline opens the article "teaser" (with pictures but without videos). From there, you can open the full article in the PlayBook's browser. Aaaaaannnnddd this is where Pipeline seems frayed around the edges, at least in this reviewer's opinion. The vast majority of sites don't publish an entire article via RSS, so you'll need to read it in the web browser. When I try this, something somewhere breaks, and the browser crashes. I'm not sure whom to fault and it happens infrequently, but it certainly detracts from the experience. Slightly less annoying is the inability to follow links in the article. Pipeline underlines the text, indicating a hypertext link; but no amount of touching will allow me to follow it. For the moment, I can put up with these slight idiosyncrasies; they are noticable, but small. If Mangoware would find someone to fix the browser crash; make those links clickable; and give me YouTube, etc. videos in-app, they might just have a winner on their hands. 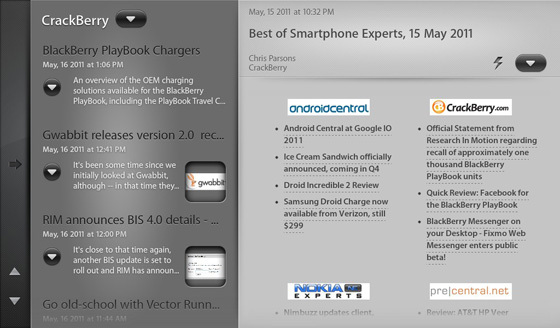 Pipeline is beautifully styled with a well-designed user interface, well on the road to being the best RSS reader for the BlackBerry PlayBook.